Lesleigh Smith, The Barn's Owner and Creative Director, lived in Fort Worth, Texas before opening The Barn. She owned an event design business, and she planned fabulous weddings and luxury travel events all over the world! 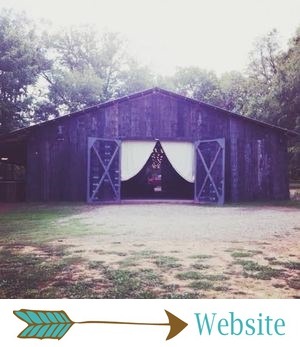 Why would a successful business owner give all that up to move to little ol' Dardanelle, Arkansas and build a barn wedding venue?! "It just happens to be where my family lives," Lesleigh said. "It also happens to be where some land became available for purchase, and it just so happened to be around the time my brother got engaged. At the time, there were two actual barn venues in the state. They weren't what [my brother and his fiance] were looking for, so we decided to build something that would suit them." Lesleigh said they all decided that if they were going to build a wedding venue, they might as well do it right! She thought she might host a few weddings and events a year in her new venue. A few... ha! "Lo and behold, I was sadly mistaken," she said. "There was a definite demand for it! We booked up fast and our name spread fast... like dry hay near an open flame!" The Barn was completed in the summer of 2012, just in time for Lesleigh's brother and sister-in-law's wedding. Before The Barn was even finished, it had started booking up like crazy! Couples were booking without ever seeing the land, and without ever seeing The Barn (because, duh, it wasn't even there yet). That's when Lesleigh knew she had something really special going on, and she knew she had to do it up right! Because Lesleigh had planned plenty of barn weddings in Texas, she knew exactly what a barn venue needed and didn't need. In the end, she decided to go all out and make The Barn all-inclusive. "I'm passionate about the fact that I think everyone deserves a wedding that could/should be published in a magazine," she said. Magazine-worthy weddings happen because all details, flowers, vendors, etc. are ON POINT. And the only way to ensure that everything is perfect is to do it all with a fabulous staff and a team of trusted vendors. "I feel like your only true advertisement is word of mouth and your reputation, and the only way for me to be able to control that and be accountable for that is to be all-inclusive," Lesleigh said. "And I've NEVER regretted that once." Being truly all-inclusive is certainly one thing that makes The Barn stand out among other barn venues in Arkansas and throughout the country. By TRULY all-inclusive, I mean that our wedding collections include everything. A few other things that make The Barn different, according to Lesleigh: "We are accommodating. We understand all brides are different and are willing to accommodate that. We don't cut corners that don't need to be cut. And we personally invest ourselves to EACH wedding." It is the personal investment into EVERY wedding by EVERY team member that has earned The Barn its reputation. Brides and grooms have traveled from pretty far away to get married here, and I think that certainly speaks volumes about the kind of magic that happens at The Barn. Fun fact: our couples have come from Las Vegas, Texas, Oklahoma, Ohio, California, Hawaii, Florida, Alaska, Missouri, Tennessee, Georgia, Puerto Rico, Bulgaria, and from all over Arkansas. We couldn't be more thankful for all of them! "I am so grateful to every single bride that has booked with us and that is currently and will book with us in the future," Lesleigh said. "I'm honored that people want to try to recreate what we have done here in little ol' Arkansas. As long as there is a cloud in the sky, I will continue to evolve our brand and the way we do weddings, and I will continue to break rules and create weddings that other people love to recreate and repin!"